I…. I must. I must, must, must, must, must. Even the grond support equpment has been Kittyized. I woudl love to fly it. Actually there will be three jets. The new logojets are themed Magic Jet, Apple Jet and Global Jet. The Magic jet is my least farvorite. 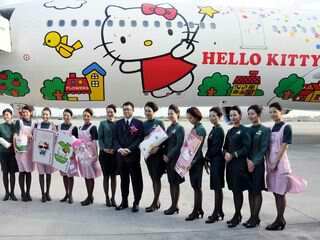 If I was a super rich CEO I rent one and buzz MR HK home for his defiance of the cute one. Anything to make my flying experience more enjoyable is a good thing. Including HK into the experience is just a bonus!!! 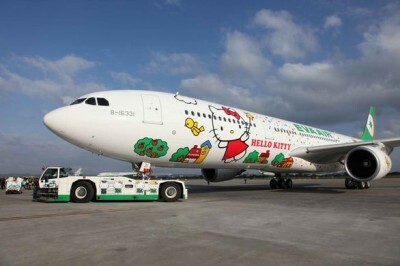 Ok even though I hate flying, I would fly on this and love it!! Are we all ten years old now? Is that what this is? Because I’d feel like I was a little kid on this plane and not in a good way. @Liz – “Fox 3” means “I have just fired an active radar homing air to air missile”. Still think I’m 10? Not so fast check your six. HKF-22 weapons free.